How do you inspire the next generation? How can we show them that our movement is worth fighting for, that change does not come easy, but has to be fought for through hard work and long hours? These are questions that a lot of activist organizations deal with on a daily basis. 9to5 is no different. With every generation that passes, there are new tools, new methods to fight for your beliefs and to spread your message. Bozana Bozovic, a freshman high schooler from New Jersey, cites her mother as inspiration for why she decided to delve into the activist space and reach out to 9to5. 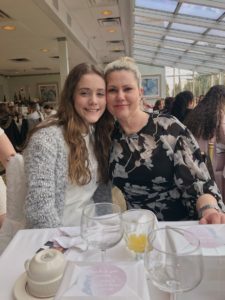 Bozana writes: “My mother is one of the most hardworking people I know…She maintained and worked on being a full-time nurse at Valley, a student at Farleigh Dickinson University, and a mom all at once”. Bozana was asked to find, research, and write a speech for an organization for one of her high school classes, and she choose 9to5. She said she chose the organization not only because of her mother, who worked incredibly hard to succeed professionally and “…still be the best mom anyone could ever have”, but also for all the other women out there who are working as hard as her and even harder sometimes, and are still struggling to provide for their families. She discusses how the topic of equal pay is incredibly important to her and how she learned “…that the issues that 9to5 is fighting for will always be something that should be on the public agenda because equal pay is a serious issue and becoming an even bigger issue in America…” Today, on average, women earn only 80 cents for every dollar earned by men. African American women earn only 60 cents; Native American women earn 58 cents, Latinas earn 54 cents, Asian American women earn 83 cents. Equal pay is an issue that impacts us all, not just the women who are being paid less. The introduction of the Payment Fairness Act on the 30th of January will be an essential step for us to get closer to the future we strive for, where everyone’s work is considered to be truly equal. Bozana ends her letter with writing that 9to5 “impacted my outlook on equal rights because it made me want to look more into it and try to help 9to5 all the way from New Jersey”. As 9to5 continues to try to make a difference for women all over the United States, I hope that our work continues to inspire others to want to join the movement. I believe in the power of the people and the power of unity. Furthermore, I firmly believe in the power of the next generation, in people like Bozana. I believe that they will be bold and they will be brave, just like many have been before them. Let’s power the change together!